Many people are under the impression that when classes end for the summer, schools are empty. But, as facilities professionals are aware, this is usually not the case. Whether it’s summer school, extracurricular activities, or recreation programs, school facilities are rarely in disuse for extended periods during the summer. For many schools, this could mean an increased demand on the building’s mechanical systems. Summer is the ideal time to make updates to the building’s mechanical insulation, because the upgrades made now will have numerous positive effects once the school year starts back up. The energy audit process involves a facility walkthrough by a professional insulation contractor, where they will measure all applicable pipes, ducts, and equipment. The appraiser may also point out areas of concern with uninsulated areas or damaged insulation, such as personnel safety, regulatory compliance, corrosion under insulation, process control, or impact on adjacent equipment. The school then receives a custom report that puts a dollar value on Btu losses and calculates greenhouse gas emissions, as well as makes recommendations for an insulation upgrade, replacement, or maintenance program. The result is a clear plan for increasing energy efficiency while saving operations costs. According to a 2011 study by the National Insulation Association, mechanical insulation saves schools, on average, 13 kBtu/sf/yr of site energy (about 20 percent of the total usage). However, shockingly, between 10 percent and thirty percent of all exposed mechanical insulation becomes damaged or missing within one to three years if installation. Over time, and depending on the operating environment, that number can be higher. The result of missing or damaged mechanical insulation is that it no longer performs as specified, meaning that all of the great energy and cost saving benefits are compromised as the insulation is allowed to continue deteriorating. This is why replacing missing or damaged insulation is low-hanging fruit in terms of increasing energy efficiency. When installed properly by thorough and experienced professionals, mechanical insulation can last for years without failing. Because of its durability, it can be easy to ignore until something happens to damage it. Replacing the missing or damaged insulation in your facility is an effective way to increase the efficiency of your overall mechanical system. While most schools are still being uses for various purposes in the summer, the hustle and bustle of the school year has calmed for now, making it a good time to consider implementing a mechanical insulation maintenance plan. Luckily, as I mentioned above, insulation is durable and generally very low-maintenance. However, implementing a schedule of regular visual inspections and routine upkeep will help ensure that your system continues to perform at peak efficiency for years to come. Learn more about how to implement a mechanical insulation maintenance plan. 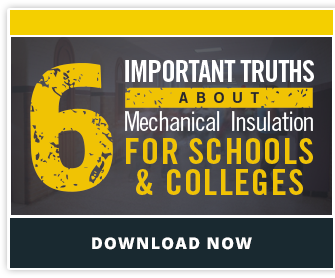 When planning your summer maintenance projects for your school, don't forget to consider mechanical insulation. The upgrades you make will help increase energy efficiency and resuce operating costs all year round.